This exhibition highlights a significant movement in radical architecture and design in Italy as well as the innovative and groundbreaking exhibition curated by Emilio Ambasz at MoMA that first presented this work in America in 1972. The Graham Foundation is pleased to present Environments and Counter Environments. 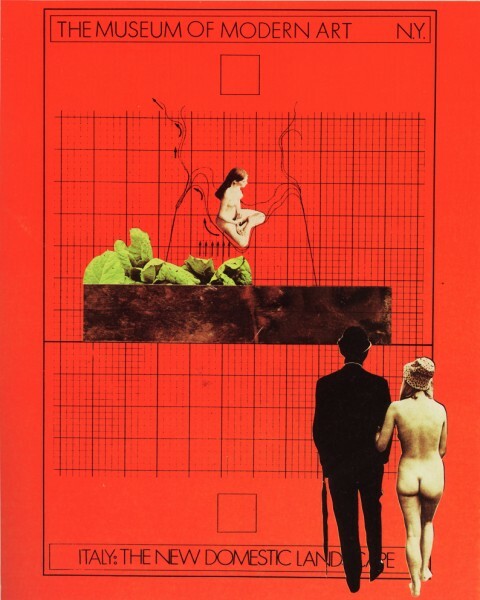 “Italy: the New Domestic Landscape,” MoMA 1972 curated by Peter Lang, Luca Molinari, and Mark Wasiuta. Under the direction and curation of Emilio Ambasz the legendary 1972 MoMA show commissioned a series of experimental domestic “environments” and a series of film and media projects by the most vibrant Italian architects and designers of the period: Mario Bellini; Alberto Rosselli; Marco Zanuso and Richard Sapper; Joe Colombo; Gae Aulenti; Ettore Sottsass Jr.; Gaetano Pesce; Archizoom; Superstudio; Ugo La Pietra; Gruppo Strum; and 9999. Environments and Counter Environments brings together for first time since 1972 these important films and media projects and returns to the original exhibition, not as a reconstruction, but as an analytical project that attempts to reassess the visionary possibilities of architecture and design. Environments and Counter Environments was originally produced by GSAPP Exhibitions at Columbia University’s Graduate School of Architecture, Planning and Preservation and first presented at Columbia’s Arthur Ross Architecture Gallery.